The Archaeological Museum was inaugurated in 2004 for a correct preservation of the numerous artefacts found in the Etruscan archaeological site of Ortaglia, a few kilometres from Peccioli. The excavations were managed by the Municipality of Peccioli in cooperation with the University of Ferrara, under the direction of Stefano Bruni. Votive objects and parts of a building came to light from a pit 10 meters deep and 4 meters wide. Due to the size and the kind of decoration, these ruins made archaeologists think of something similar to a temple or at least a sanctuary. The finds were fragmented, since in the 4th century BC the structure they were part of had collapsed, because of a fire. The upper part of the pit, due to an erosion, later collapsed to the north-west, causing the finds to fall from a height of about five meters. Many votive objects, such as the weights of the loom and the spools for the thread, typical of women's work, led to the belief that the sanctuary was dedicated to a female deity. Top of the range of the collection is a red-figure Attic kylix, certainly attributable to the famous Greek painter Makron, working in Athens around 490 - 480 B.C. 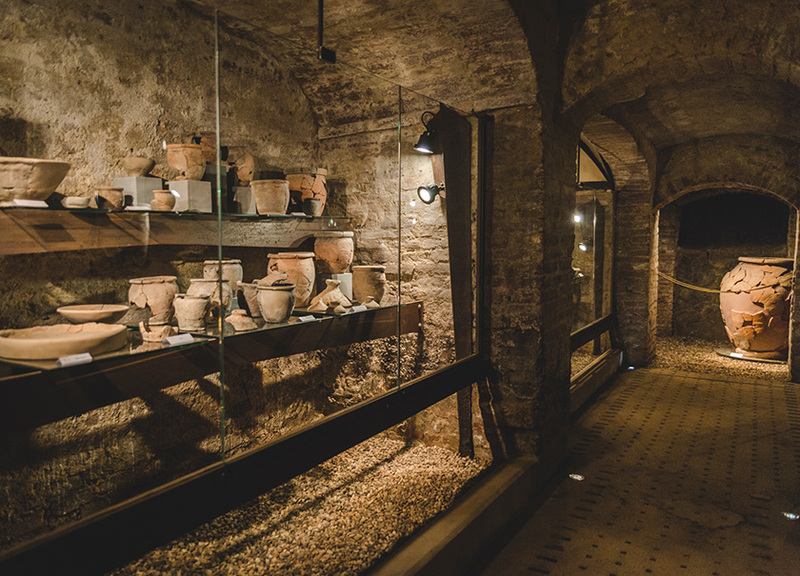 Since 2007 the Archaeological Museum is located in a new, suggestive location, 33 Carmine Sq., within a tunnel system still recently used as wine cellars, but which in ancient times probably contained underground tombs. 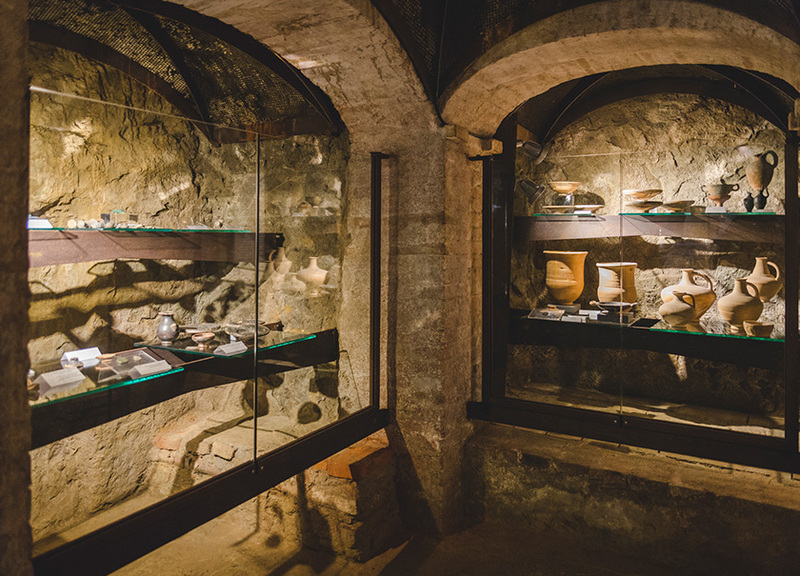 In the new location other exhibits have been added: the grave goods from the Etruscan tomb of Legoli (excavation of 1930), a big loutérion (a basin for ablutions), as well as a series of materials relating to nocturnal cults, linked to a divinity similar to the Greek Demeter. Among these it is possible to admire a kèrnos (cylindrical vase), which at the beginning included probably also four cups for votive offerings to the deity. In the temple hall a big scale model reproduces the Etruscan temple, rebuilt according to the rules of Vitruvius (a theoretician of the Augustan age architecture). A considerable importance was given to multimedia in the new exhibition. We have thought that the most recent acquisitions in this field could meet the needs and the way of learning especially of students and young generations. 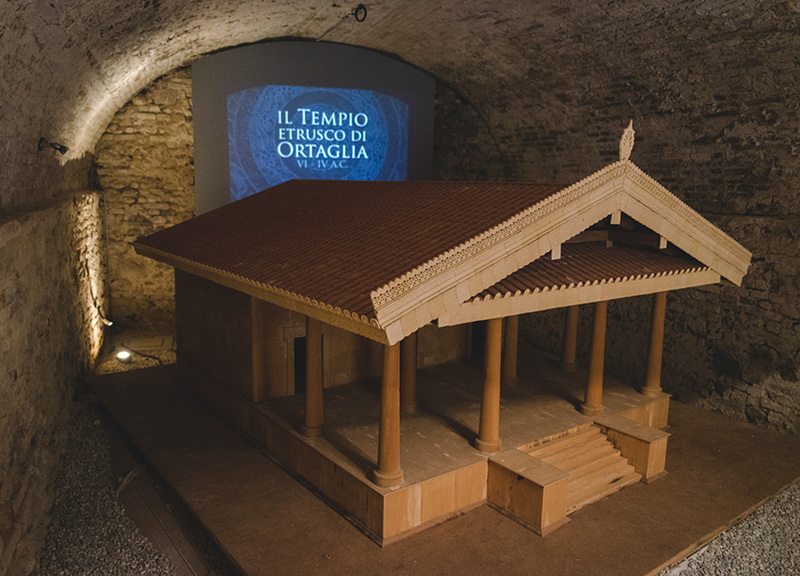 The model of the temple was thus equipped with multimedia supports that allow to "interrogate" it and to enjoy three-dimensional videos thanks to special glasses. In addition, a screen and a projector have been set up in the media room, where you can watch videos related to the history of the Ortaglia temple fire. 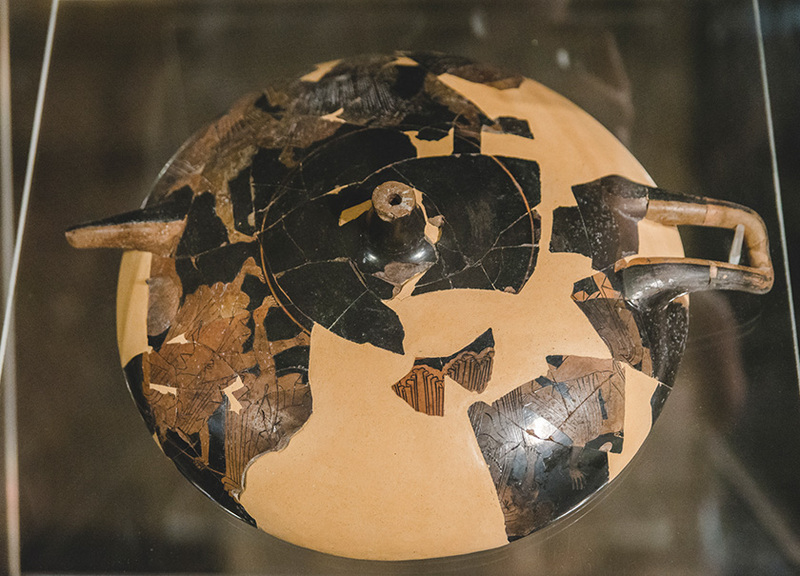 The finds, belonging to the territory north of Volterra, have allowed to shed new light and develop new interpretative possibilities on the history of the Etruscans from that city, of whom the late-archaic period still remains quite mysterious. The materials found during the excavations conducted by the Tectiana Archaeological Group on the site of Saint Mustiola near Ghizzano were added to the Etruscan collection from the Ortaglia site. The site of Saint Mustiola is located on a small hill along one of the most important ancient communication routes in the territory: this route connected Pisa and the coast to Rome. The geographical and commercial importance of the place allowed the succession of various settlement phases: a Roman phase, witnessed by the cistern of the 1st century AD, a Langobardic phase, of which large quantities of objects and ceramics of daily use remain, and finally a medieval phase, with the construction of a small church dedicated to Saint Mustiola. Inside the church, along one of the perimeter walls, a female burial with precious bronze objects was found. 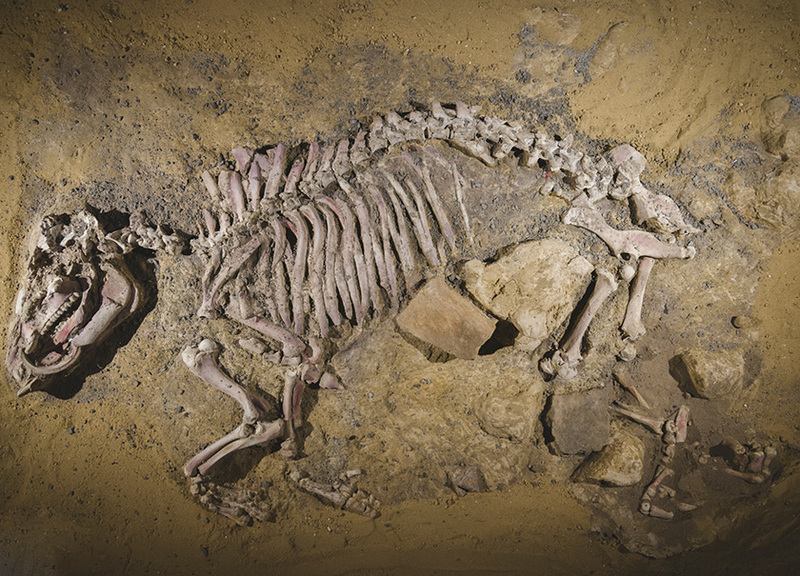 The bones were recomposed and the objects restored. The grave goods, consisting of a headgear, a ring and a belt, are dated between the 13th and 14th centuries. 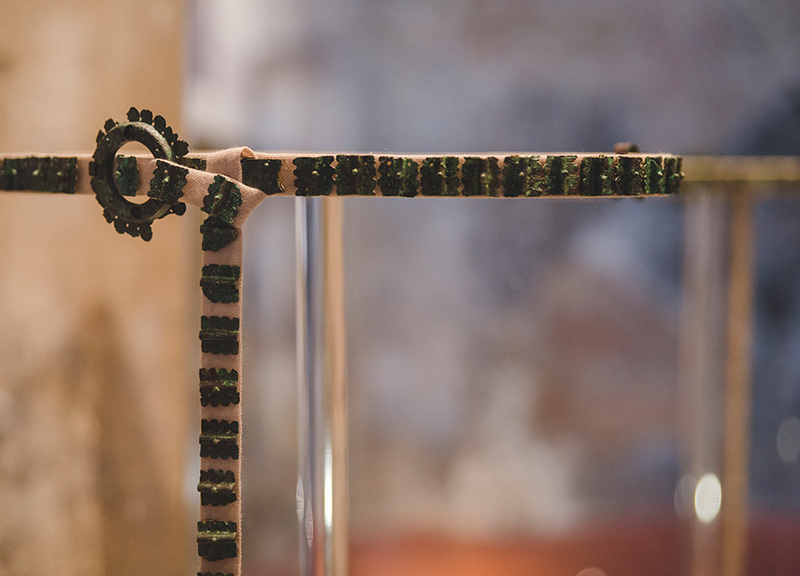 In Italy they represent a rare example of objects of this kind, especially if we consider the big amount of decorative elements that make up the belt. 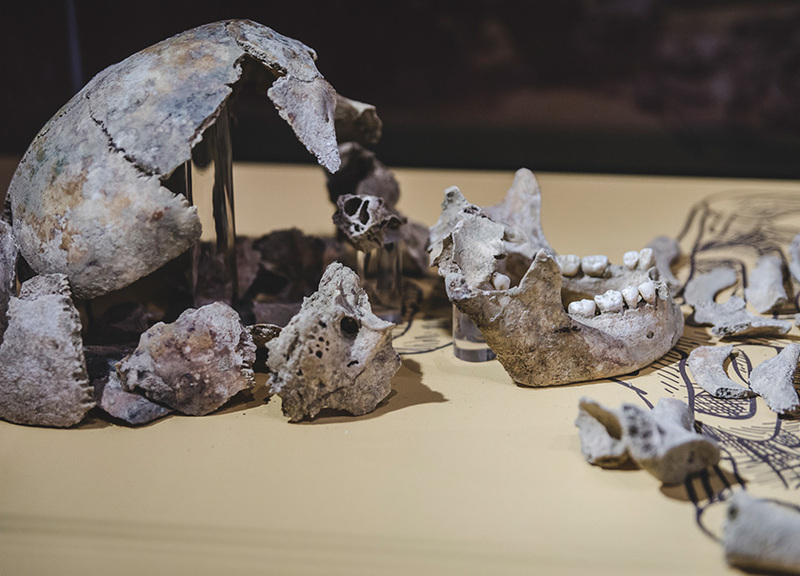 The objects and the anthropological study of the buried bones have allowed us to outline some aspects of the life of the deceased. The discovery of Isadora, this is the name we have chosen for her, opens new scenarios on the type of settlements that in those centuries characterized our municipal territory. A small hill that today is outside the main routes certainly in the past had a central position. Download the brochure “The excavation of Saint Mustiola”.